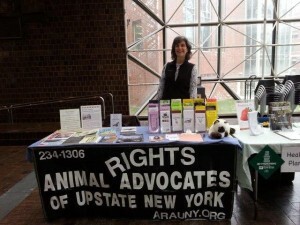 ARAUNY tabled at the University of Rochester’s Great American Meat-out today, at the invitation of SAVVY, Student Association of Vegan & Vegetarian Youth. Also tabling was RAVS, Red Fern selling various treats including mini cupcakes, Vive selling chocolate chip cookies, and Lori’s Natural Foods with free samples of almond milk chocolates, coconut “bacon” bits, and brown rice lasagna. Everything vegan and delicious of course. There was great music from U. of R. groups, and the SAVVY members provided delicious loaded nachos. We offered lots of information and made many connections.